Pics Asus has confirmed the UK release date of the new Nexus 7 tablet, or 7 2 as it has become known, the latest Android 4.3 fondleslab it makes for Google. The quad-core, full HD 7in slab will be available from 28 August in both 16GB and 32GB capacities at £199 and £239 respectively. 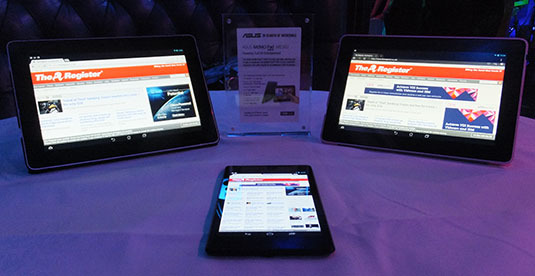 At a press event in Blighty last night, Asus was keen to tout its own-brand Nexus alternative, the MeMo Pad HD 7. 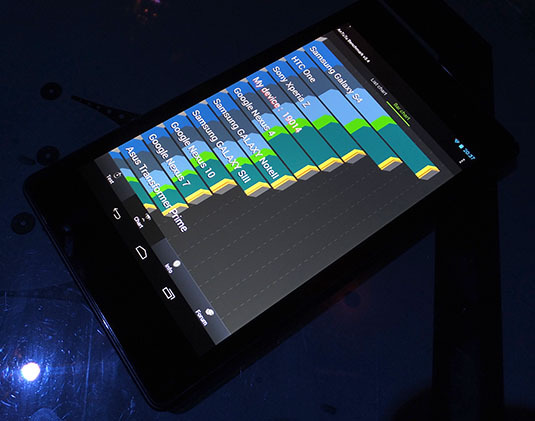 This 16GB 7in tablet features a quad-core CPU clocked at 1.2GHz and a 1280 x 800-pixel 7in display. It runs Google's Android 4.2.1, and at £129 it’s a good deal cheaper but to be honest, looks it. However, the MeMo Pad HD 7 does get one over the Googleslab as it features micro SD card storage expansion. The MeMo Pad HD 7 (ME 173) will be available from 1st September and its 10in full HD incarnation with 32GB, the MeMo Pad FHD 10 (ME302), will follow up on 6 September priced at £299. 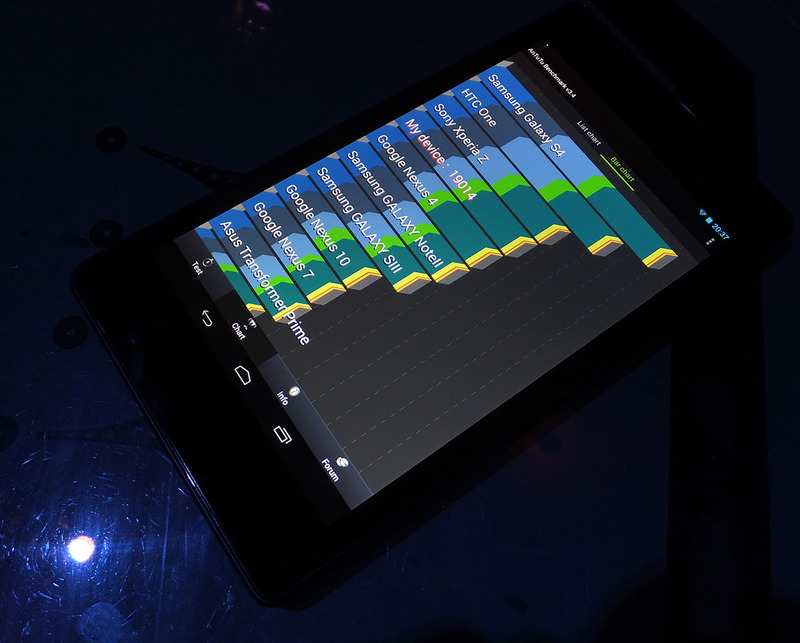 In the hand, both the new Nexus 7 and HD 7 have similarly placed controls which involves a fumble for the power button on the side where the volume rocker is placed too. 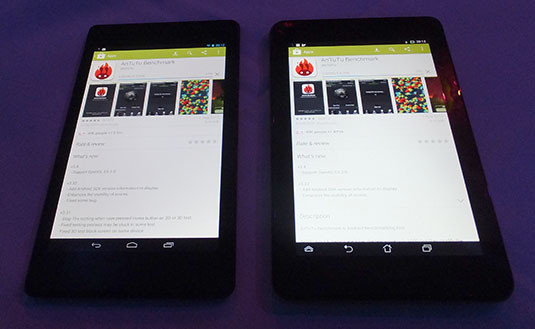 The HD 7 is slightly larger overall and a lot thicker, and feels it too. 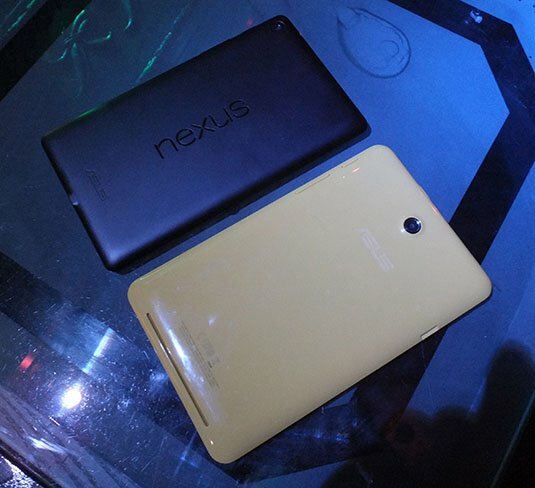 Its plastic back is available in four colours but this isn’t enough to detract from the fact that, alongside the Nexus 7, the HD7 definitely looks outclassed when it comes to styling. While bloggers queued to use the photo tent area, I thought about doing something a bit more useful and on both devices downloaded AnTuTu, the Android benchmarking app and gave it a spin. The new Nexus 7 features a Qualcomm QCT APQ8064 FLO (an updated Snapdragon S4 that utilises DDR3L RAM) clocked at 1.5GHz along with an Adreno 320 GPU – more detail of its innards here. The Googleslab stuffs 2GB of RAM in there too, so you don’t ever get the impression it’s struggling. 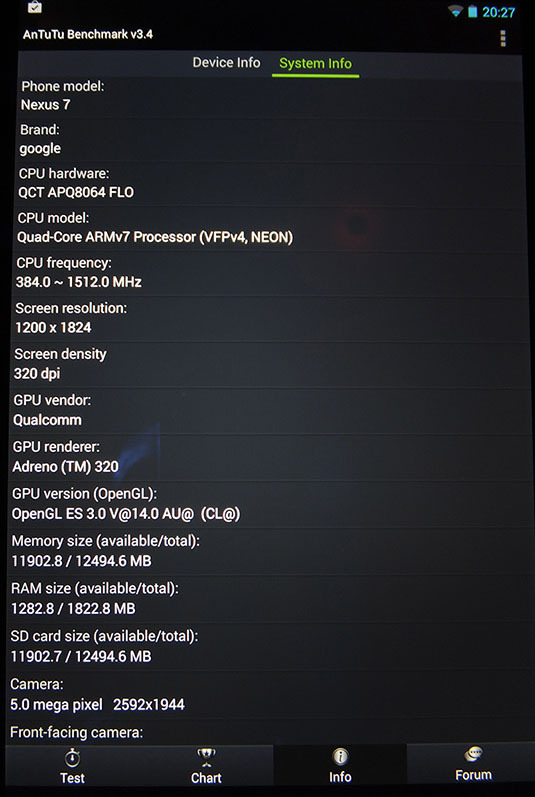 After several run throughs with AnTuTu, the best result was 19014, just ahead of the Nexus 4. 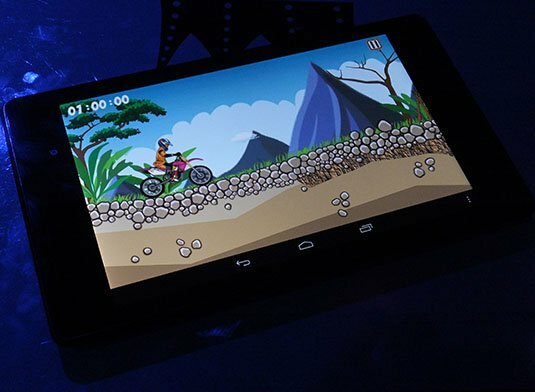 A Mediatek MT8125 quad-core CPU clocked at 1.2GHz runs the show on the Asus HD 7 and only 1GB of RAM is on board. A PowerVR SGX544MP handles the graphics. The highest AnTuTu score here was 13143, putting it just above the old Nexus 7 from around this time last year. Asus will need to do some convincing for folk to choose the HD 7 over the Nexus 7 2 but the price and expansion slot will give pause for thought and as it makes both, the company does get two bites of the cherry here. Yet it’s the hi-res screen that many fondleslab users crave these days. Interestingly AnTuTu showed the Google Nexus 7 as having a resolution of 1200 x 1824, presumably those 96 pixels that would take it up to 1920 (for full HD width) are lopped off for the navigation controls. You get a pixel density of 323dpi according to Google although AnTuTu says it's 320dpi. When put up against the 213dpi of the MeMo Pad HD 7 soon becomes obvious when up close and personal with this higher level of detail giving added vibrancy to the viewing experience.